Auli Skiing and Snowboard School offer different types of Skiing Packages for Auli as per suit to your budget. We offer economical to luxurious types of Packages with best and valuable services. Our auli skiing packages can be customizing as per your option too. Select your packages or email us to get your customize packages for Holidays Packages for Auli India..
" Skiing in the Shadows of Mt. Nanda Devi Second highest peak of India"
Enjoy Skiing on the longest and finest Slopes of Indian Himalayas in the Shadows of Mt. Nanda Devi (7817 meters), one of the highest and most fascinating peaks in the world. The other high peaks around the slopes are Kamet (7756 Mts), Mana Parbat (7273 Mts), and Duna Giri (7066 Mts.). The trip also inlvoves 2 days of driving 9 (to and fro) along the Ganges and Alaknanda river as well as visiting the ancient towns e.g. Devprayag, and Rudraprayag etc.. Check inn Time is 12 Noon and Check out Time is 10 AM. Welcome Tea–Dinner and overnight stay at hotel / resort. Day 2 – Early morning breakfast – Transfer to Ski slope – Skiing –Lunch – back to hotel- evening Tea. Dinner. You will be assigned an instructor, who will ensure that you learn the basics of skiing. He will be with you on the slopes throughout On this day, you slide, slip, fall, bump into trees but end up having a lot of fun. The slopes are warmed by excited cries and laughter of entrants. Post your session, have a sumptuous meal at the Guest house followed by some rest and a short session to stand and balance on the skis and also apply brakes on your own. After that, skiing lessons will resume. Day 3 – Breakfast - Onwards Journey. 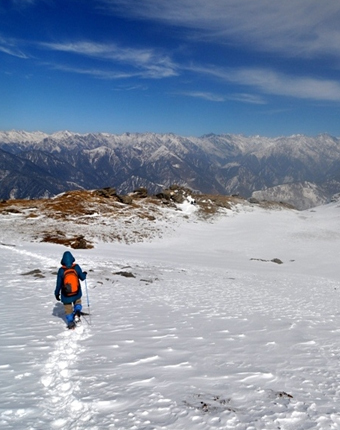 Auli also boasts of Asia's longest - 4 km - cable car (Gondola). It also has a Chair Lift and a Ski-Lift. Take your ride in the cable car to have an experience of a lifetime. Views of high Himalayan peaks like Mana, Kamet and tallest of all Nanda Devi.The ride is functional from 0900 HRS to 1700 HRS. The ride is ideally for 35 minutes (to and fro). Post the cable ride we move to the Joshimath by your journey back home. The memorable adventure comes to an end here. After Breakfast- Check out. Please contact us for complete holiday package that will include sightseeing in Taxi, Hotel Booking along with skiing in Auli. We will give you an unbelievable quote that will help you enjoy more at lesser charges! Auli Skiing offers variety of Ski and Snowboard courses every winter. Our ski and snowboard courses are designed for all age groups. Come this winter and Learn skiing or snowboarding at Auli Himalayas. Copyright © 2017 Auliskiing.in. All rights reserved.